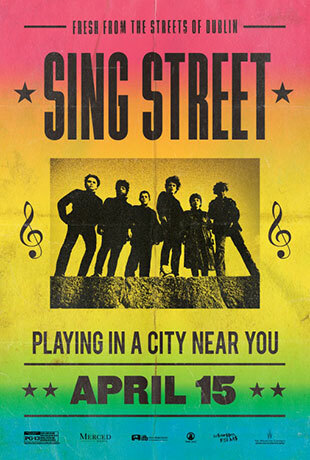 The lyrical lad of film-making, in the form of Irish writer-director John Carney (who gave us the wonderfully musical drama in 2007’s “Once”), is at it again as he brings the continued inspiration of music and motivation in the engagingly festive coming-of-age musical melodrama Sing Street. Carney, the former member of the Irish rock group The Frames, provides the frothy insight for the musical mind and the passion that is connected to the artistry of creative tune-making. The crafty and colorful Sing Street could be perceived as the junior-sized extension of the aforementioned “Once” where lyrics and love methodically come together in unison. Sing Street is all over the map — and that is strangely a good thing in this particular case. Boasting elements of nostalgic 80s-era music, teen romance, outcasts, self-identification and the creativity process, Carney’s finger-snapping gem is an examination of a youthful period of yesteryear where expression in song and quiet examination of affection spearheads the charm and cheekiness of this intuitive, vocal narrative. Clearly, Carney’s revered exposition resonates because of his treatment of the troubled teens and the healing they undergo when they allow the application of music to consume their sense of doubt and disillusionment. Overall, Sing Street is reflective and resounding as the robust soundtrack and the throwback to the rollicking 80s is simply sumptuous in Carney’s imaginative celebration of bouncy tunes and growing pains. Irish youths joined at the hip with 80’s pop music is the premise for this passage of life story taking place in Dublin where we are introduced to teenager Cosmo (newcomer Ferdia Walsh-Peelo). Sadly, Cosmo has a complicated domestic existence and the household finances are in shambles. For the transferred Cosmo he is coming from an ideal school to another one that is not so comforting in the rough-and-tumble Catholic school that he is currently trapped at for his so-called academic nourishment. In blocking out the indifferent priests and wayward hardball students that rule the roost, Cosmo does look forward to focusing his energies elsewhere to ease his embedded angst. Enter Raphina (Lucy Boynton, “Copperhead”) whose nearby presence is therapeutic for the conflicted Cosmo. So how does he go about impressing his discovered dreamgirl of choice? Why start a band of course! After all, the chicks love musicians so why would his precious Raphina be any different in this respect? Enter Cosmo’s big brother Brendan (Jack Reynor, “Transformers: Age of Extinction”). Brendan is the right source to go to for music consultation. If Cosmo is going to tackle the art of playing decent music he should learn from someone who enthusiastically breathes the beats of the day. From The Cure to Duran Duran, Brendan is the informative sibling that gives his little brother an invaluable schooling of song and intimacy all wrapped up in a nice artistic package. The complexity to the film’s natural rhythms is subtle and smooth. Carney keeps this sweet story on track as he delves into the art of love young love with music as the connector of feelings and the foundation of purpose. The recipe is quite straight-forward: Cosmo is mesmerized by Raphina and his yearning for making music his universal language of self-identification and self-sacrifice is realized with Carney’s sense of devotion for his youth-oriented protagonists and their connection with music that identifies their underlying turbulent times. The pulsating soundtrack is the critical key to the solid appeal that makes Sing Street such a resounding gem. The sounds of Hall & Oates, Duran Duran, and The Cure are sizzling to those that were defining their adolescence back in the 80s when the vibes dictated such tender and catchy tunes served up by the likes of Spandau Ballet, for instance. Plus, Carney and Danny Wilson frontman Gary Clark co-wrote the spirited songs that are delivered from the talented lips of the film’s young awkward musicians. Singing staples such as “To Find You,” “Drive It Like You Stole It,” and “The Riddle of the Model” are all moving and momentous footnotes to Carney’s vision of familial hardship, quieted teen rebellion, first love conquered quests, schoolyard bullies and of course the music-making as a passport to serenity. As convincing as the featured musical offerings, are the focused performances particularly by the enticing lovey-dovey duo of Walsh-Peelo’s introspective Cosmo and Boynton’s aspiring model and muse Raphina. As the brotherly mentor, Reynor’s Brendan is a revelation because he passes on the delightful disease for 80’s pop rock sensibilities to his kid brother with skilled know-how and pride. Thankfully, Carney’s underrated musical masterpiece “Once” and even Alan Parker’s 1991 musical dramedy “The Commitments” can be found at the rousing root of the poignant and soulful Sing Street. What else can one say at this point other than to restate how the creatively crafted Sing Street is welcomed as manufactured music to one’s ears.